The Utrecht-based architect Willem Maas (1897-1950) was a friend of Gerrit Rietveld and Sybold van Ravesteyn. He worked with modern materials and techniques but as a devout Catholic with commissions to design studios for the Catholic Radio Broadcasting Company (KRO), Catholic schools, parochial houses and parish hospitals he deviated sharply from the free-thinking, Communist-slanted avant-garde of De Stijl. 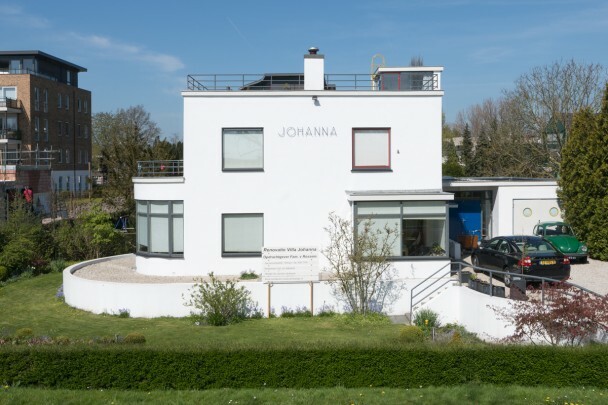 In 1929 he designed a modern white villa for Toon van Bentum, owner of a metal construction works, one of whose conditions was that it should have steel window frames. The white-rendered house makes further reference to shipbuilding. It has often been suggested that Rietveld helped with the interior and the exterior and Piet Mondrian with the leaded windows but this is unlikely. The house was restored in 1987.